Coming up this weekend (Memorial Day weekend each year) is the annual Bike The Drive Ride. This is a time when they close off Lake Shore Drive downtown to vehicle traffic and allow participants to ride their bike along the drive. From the north end by Bryn Mar to 57th street by the Museum of Science and Industry, the drive is open to bike riders from 5:30am-10:00am. Come and enjoy the scenery and chance to take on the drive. The complete ride (from Bryn Mar to 57th and back) is 30 miles. You can ride and much or as little as you like. There are snacks and water for bike riders at 57th, Bryn Mar and near Grant Park. 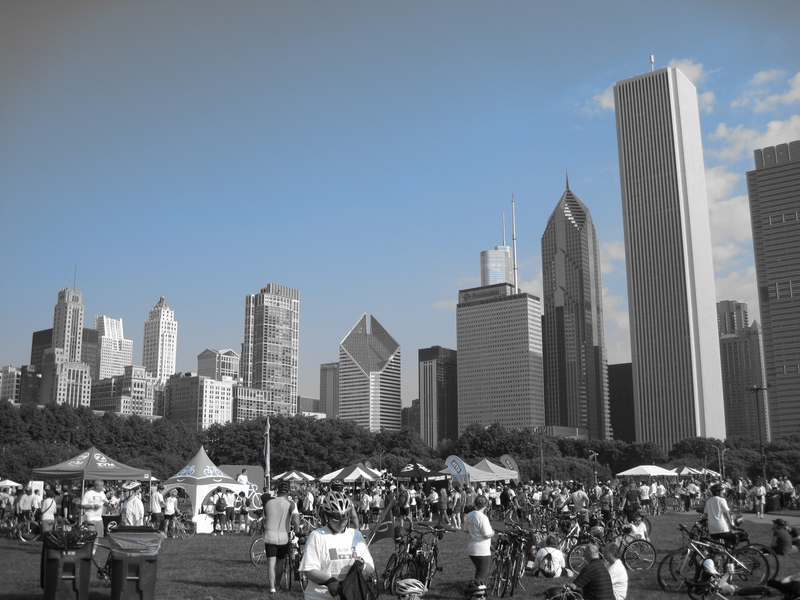 Here is a photo from the pit stop at Grant Park from last year. You can register online until midnight Friday, May 27. Register at the Merchandise Mart on Saturday, May 28, 10 a.m. to 2 p.m. If registering at the event on the morning of Sunday, May 29, we suggest you arrive early. This entry was posted in Amusement, Chicago, Festivals, Holiday, Life, Sports. Bookmark the permalink.